The vice president returns to Indiana with a display of unity amid suggestions of internal friction. INDIANAPOLIS — Vice President Mike Pence will return to his home state of Indiana on Friday with the two men who helped engineer President Donald Trump’s successful 2016 election, in a show of unity with his boss aimed at rebuffing suggestions that Pence is building a shadow campaign operation. Accompanying Pence on Air Force Two for a day of campaign events will be Brad Parscale, the newly-named campaign manager of Trump’s 2020 team, and Corey Lewandowski, Trump's first campaign manager and close confidant who assumed a role with Pence’s leadership PAC last month. Close advisers to Pence tell NBC News they will ramp up the vice president’s presence on the campaign stump, supporting midterm candidates even as they dismiss recent reports that Pence is taking a larger role than Trump on the trail. “We’re not letting up — only going to be out there more,” said Marty Obst, the head of Pence’s Great America Leadership PAC, the outfit started by Pence allies one year ago to pay for Pence’s campaign endeavors across the country. Obst will also join Friday's trip. In Indianapolis, Pence will serve as the keynote speaker at an event promoting the administration's tax cuts and then headline a fundraiser for three GOP Senate candidates. Over the last year, Pence has headlined a slew of campaign events across the country and raised more than $20 million for a litany of political entities including his own leadership PAC, Republican candidates and the Republican National Committee. The addition of Lewandowski is a recognition of that coordination, advisers say. On Friday, Pence will speak at a tax policy event hosted by America First Policies, the pro-Trump group that advocates for the administration’s agenda. The event, his fourteenth such appearance for the group this year, gives Pence the opportunity to deliver a stump speech among a crowd of hundreds that is more reflective of an electric campaign rally than a tax policy forum. The vice president will also hold a fundraiser on Friday afternoon for Republican Senate candidates Mike Braun of Indiana, Josh Hawley of Missouri and Jim Renacci of Ohio. Pence is expected to help bring in a fundraising haul of over $500,000 to be split among the three candidates. Pence has filled the early election-year void for President Trump, who has taken part in only five campaign related public events in the last eight months. Advisers to Pence say his ambitious early 2018 effort was first sketched out during a January meeting at Camp David with the president, House Speaker Paul Ryan and Senate Majority Leader Mitch McConnell. Pence has kept a close-knit political operation around him to follow through. This spring, the vice president hired Billy Kirkland away from the White House to help coordinate his political work with that of the White House, the national campaign committees, and his own leadership PAC. But as Kirkland enters the vice president’s office, Jen Pavlik, the deputy chief of staff of operations to Pence, is departing. Pavlik, who was considered as the gatekeeper to Pence during his term as governor in Indiana, was Pence’s longest-serving aide, joining him in 2001 in his first year in Congress. She then moved to Indiana in 2013 to serve in then-Gov. Pence’s office before returning to Washington to join the administration. Pence’s other longtime aide, Josh Pitcock, left his role as chief of staff to the vice president last June to work for the tech company Oracle. Pence spent the spring stumping for Republican candidates, including vulnerable House incumbents like U.S. Rep. Erik Paulsen, R-Minn. “Congressman Paulsen has been fighting shoulder to shoulder everyday with President Trump,” Pence tried to instill in a Minneapolis crowd in March. That same day, Pence raised more than $600,000 for Protect the House, a campaign fund that specifically aids his PAC, along with House Majority Leader Kevin McCarthy's super PAC, the National Republican Congressional Committee and 22 vulnerable Republican House members. He has also gone on the offensive against opposition candidates, taking swipes at Sens. Heidi Heitkamp, D-N.D., Joe Manchin, D-W.Va., and Joe Donnelly, D-Ind., in their respective home states. “The truth is Heidi Heitkamp hasn’t been putting North Dakota first, and I don’t know about the rest of you, but I think the people of North Dakota deserve better,” Pence said from another America First Policies-sponsored event this spring in Fargo. The vice president has never publicly crossed the president since entering the White House. And on the campaign trail, he repeatedly espouses his praise for the president — and often delivers the message on Trump's behalf. 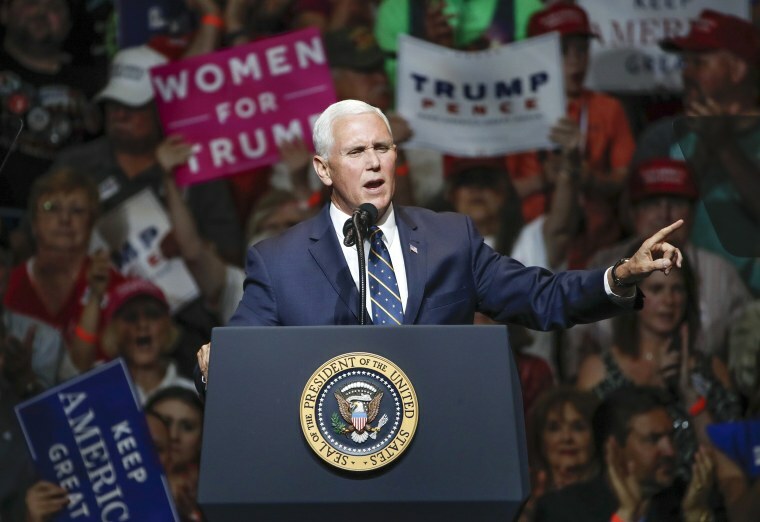 “I bring greetings from a man whose leadership made these tax cuts possible, a man who has great admiration for the strength and the character of the people of North Dakota,” Pence told the throngs of supporters during his Fargo speech.